Like most my 1979 rear quarter spoilers have lost their lower attaching bolt. It appears they were held on with some adhesive. I am going to make new bolts with holes in the head to give the adhesive something to grip but what is a good adhesive? Urethane to metal. I tried multiple epoxies would not hold. The water activated gorilla glue wouldn't hold. 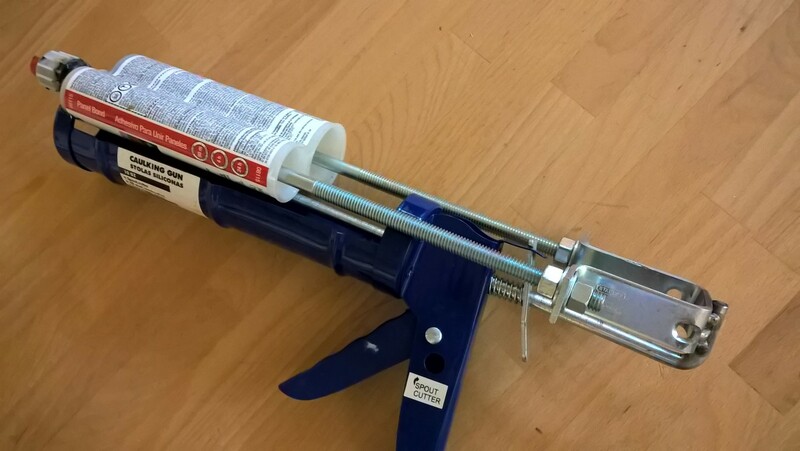 Instead of buying one of those expensive panel bond applicators, just use a dollar store caulking gun and a few extra parts to make your own! I have the homemade applicator gun and panel adhesive was what I was thinking. But for a dab no bigger than a dime I was hoping someone had found a good alternative adhesive. 3m makes some pretty good auto grade double stick tape, have you looked into something like that? Have you tried emblem adhesive? I also check Devon's website. Maybe call their applications guys and see what they'd recommend. Adhesives for Bonding Plastic to Metal. ... In plastic to metal joining applications, advanced epoxy, silicone, cyanoacrylate and UV cure adhesive systems are easy to apply, have convenient cure schedules and offer high performance in difficult environments. a very strong quick-setting adhesive, based on cyanoacrylates or similar polymers. If the piece if off the car, you could take it to any body shop and ask them to put some panel bond on it for you. They wouldn't charge you much and would only take a minute. Then you don't have to worry about the applicator or buying a whole tube. Here is a cheap product that seems to be crazy strong. I decided that I didn't want to use the super glue as it is a acrylic resin that is hard on flexible when cured. I'm not saying it won't work, it has held strong for Brashanic_IM. I just want something strong and flexible. I really liked the panel adhesive but didn't want to pay that much for a dab. While looking for flexible urethane filler I found this Bondo brand stuff. I normally shy away from your off the shelf auto parts body supplies as I have never had much luck with them and I have been around professional body supplies most of my life. But I thought I would give it a try as it was only $10 or so. The package says it can be used as a filler and to adhere big rips in bumper covers back together. So... I thought let's see how strong it is. I made up some flat bolts to glue to the spoilers and mixed up a little of the flexible filler. This stuff sets in 6 minutes and within 20 min was stuck so good I was going to rip a chunk of the spoiler off before this bolt comes off. This stuff is crazy strong, i haven't tried it as a filler as I was already using the glazing putty bit it is fairly thin and easy to spread. Not sure how easy to sand though. Just thought I'd share. I got it at AutoZone. Wow. That DIY applicator gun is brilliant. I know the official version of those are horribly expensive. 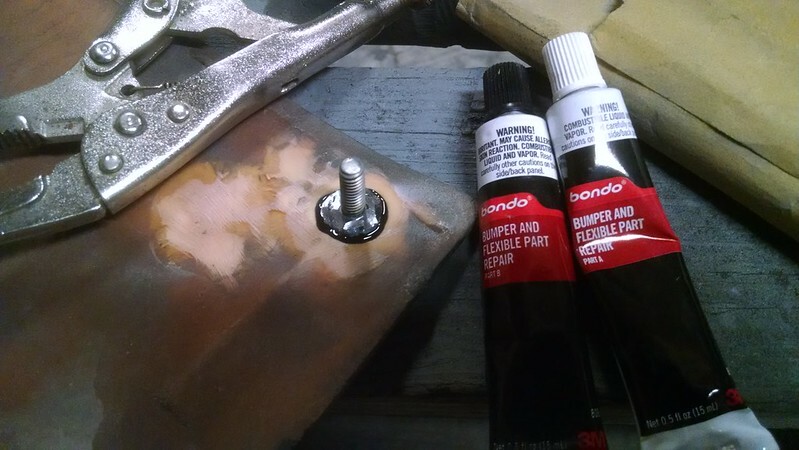 Bondo makes some good stuff, I'm a fan of their "plastic metal" that comes in a similar tube. if i recall the factory meted the head of the flat bolt into the urethane, I heated up the head of the bolt and melted it into the plastic so far it has held for 15 years. I thought that too. But there was some really old adhesive on there so I thought it was like that from the factory. It was on both sides.